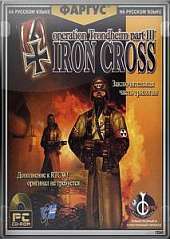 This is the third in a trilogy of pirate Russian-made add-ons combined with the original game Return To Castle Wolfenstein that were intially released as a retail products but have been allowed to be downloaded as separate mods. This happens on June 23, 1941 at the Norwegian coast. A strategic unit for the soldiers of the German forces was ordered off the English coast, which is the port of Trondheim. The value of the port was Lokatore, from which German intelligence diverted all Allied movement in the northern seas. The situation worsened the night of June 24, when from Trondheim emerged guests: Spec. Troops from the Soviet Army. They were a few thugs for the sole purpose of seizing codes at any price, even if in the face of the Allies. A conflict broke out between the three forces - Russians, Germans and the British. It's the only of its kind in the history of the Second World War! Private Adam Stec is less than two days a hero in Fascist Germany. He alone was able to preserve Trondheim's radar and realized the early arrival of standby troops to counter the attacks.